When the current owner and his family moved to the sprawling property at 700 Delong Road, he knew he wanted a place where his two small children could play and explore. He also wanted a place that was ideal for family gatherings and an indoor/outdoor lifestyle. With plenty of natural light and a beautiful view to the outdoors, this property offers all of that and more. For those who don’t believe it’s possible to own acreage in Lexington, the Delong Avenue home is a hidden gem. It’s located just southeast of Man O’ War Boulevard and Richmond Road, so all the city amenities are just a short drive away. The property lines to the East and South are next to Juddmonte Farm and include a beautiful pond and private in-ground pool. The property sits on nearly 13 acres, which include a renovated barn and plenty of green pastures (the previous owner had a Bloodstock farm). 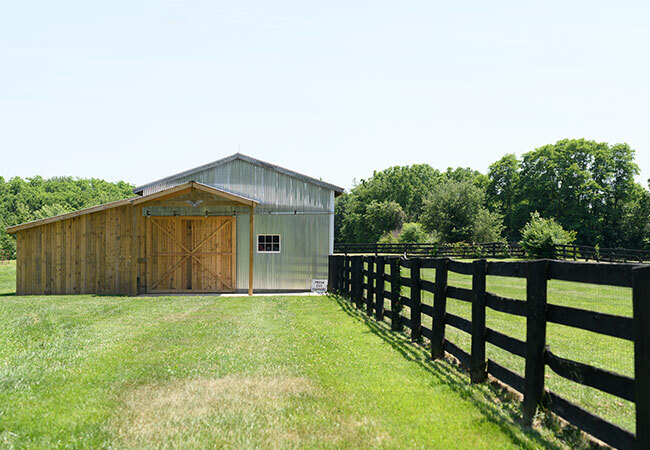 While the current owners don’t keep horses, the barn is large enough for a handful of four-legged friends to comfortably reside in, and is equipped with concrete floors, water and electricity. The home was originally constructed in 1964, and major renovations took place both in 2008 and 2013. 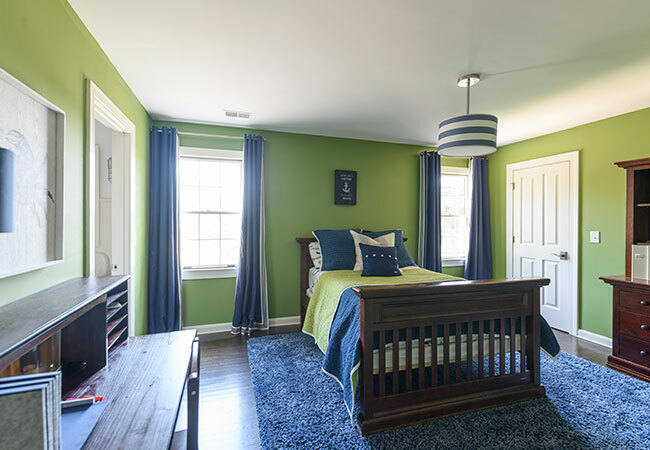 When the family moved in in 2014, they worked with Jessica Cull of Design Link and builder Mike Childers on a number of interior and exterior projects to give the home an updated look. 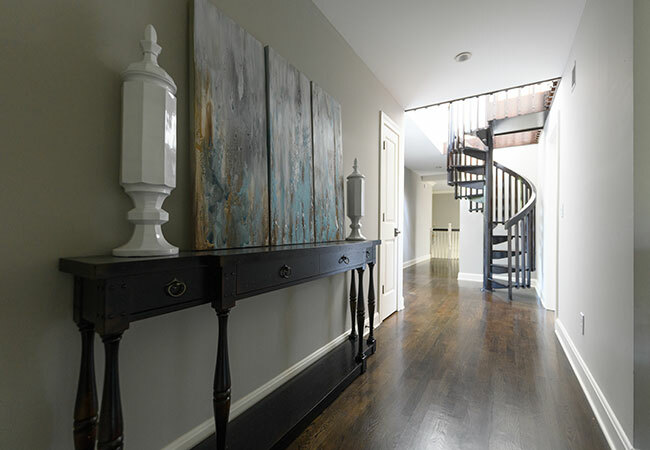 There is a copious amount of natural light and gorgeous custom millwork throughout. One of the biggest changes was the home’s exterior. It was actually modeled after the architectural style found at Keeneland –limestone and capstone accented walls with broad wood beams and angles true to the historic racetrack’s distinct timbering. While the exterior has similarities to Keeneland’s architectural elements, the interior features a mixture of farmhouse and French country design elements. 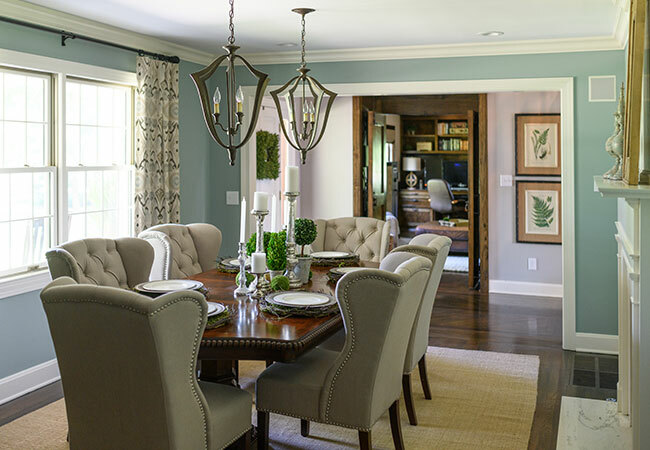 Originally, the outer portion of the home was finished in teak stained a deep red, but it was repainted in a chic, soft gray that gives it a more contemporary look. 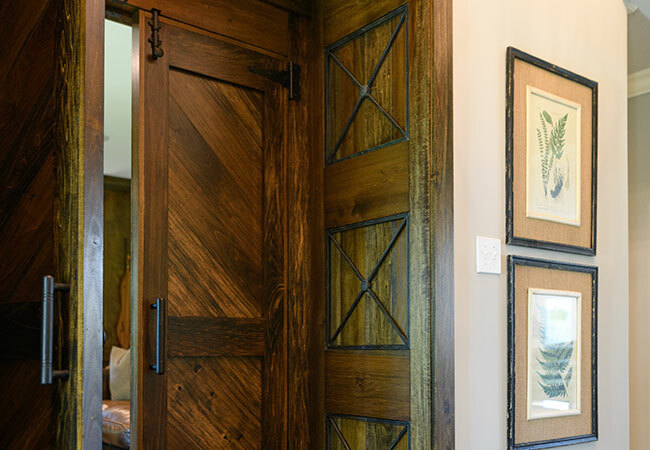 For the owners, changing the coloring of naturally stained woodwork and built-in cabinetry to achieve the desired design was one of the most challenging aspects of the remodeling process, but they agree that it was worth the extra cost and effort. The grand two story foyer is flanked by a cozy dining room to the right and a masculine study to the left. 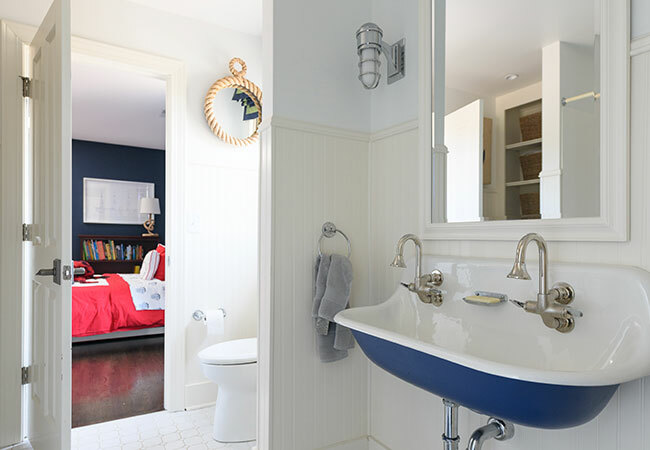 The home’s study is a departure from the fresh, almost seaside-inspired color palette, but the choice was a wise one. The especially striking space offers a feeling of deep relaxation. 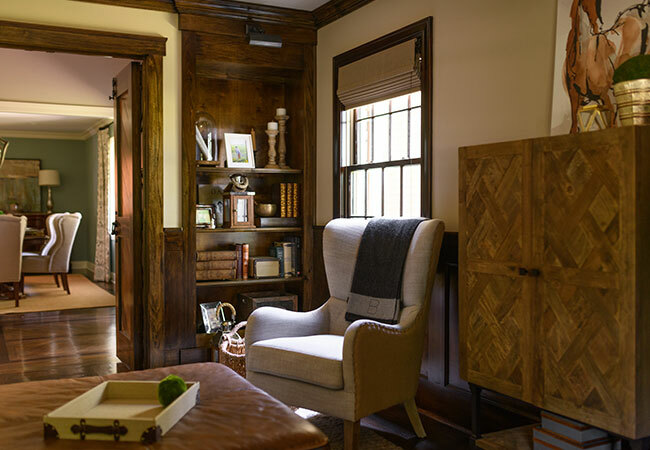 The doors of the study were specially designed to bring the feel of the rest of the home into the library setting. This was done by adding unique cast iron decorative inlays that are completely encompassed in the woodwork trim. Said the owner, “Much focus was put into this room, with deep, dark woodwork, which creates a grand entry into the front foyer.” The walls feature dark stained wainscoting with built-in bookshelves, truly evoking the feeling of being in a classic library –including the enticing aroma of wood and antique books. 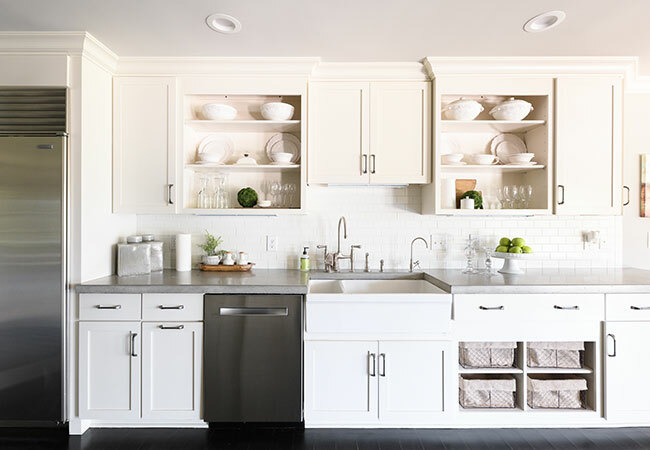 In addition to the new color pallete, the homeowners rennovated the kitchen. Concrete countertops were installed and the cabinets were updated. 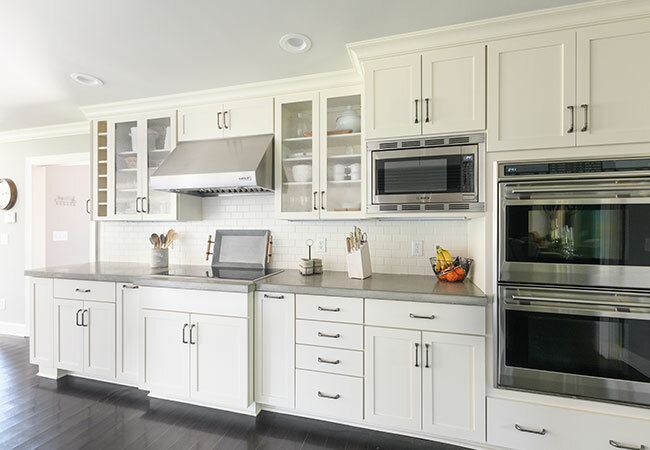 The kitchen features all high end appliances with a Sub Zero refrigerator and Wolf range. The entire rear of the home features large glass doors that open to a gorgeous back patio and an enchanting view of the partially wooded acreage of the property that, according to the owners, makes waking up with a cup of coffee to the sun shining through the glass, “an absolute delight”. Cull also mentioned that the home is very well designed from an architectural standpoint as well. “All of the major areas flow so well together,” she said. “The family wanted to create a rustic modern feel that was very comfortable and nice-looking but also kid friendly.” For example, the breakfast room features bench seating and the family room is an open, relaxed area, but it still connects to the other main living areas, making it possible to keep an eye on the kids while cooking or entertaining. Another striking centerpiece of the home is a wood-burning blue Kentucky limestone fireplace with a large limestone capped hearth. The family says it has been great for gathering together on cold winter days. The fireplace displays a historic broad beam mantle recovered from a retired Woodford Reserve bourbon barrel storage facility that shows antique aged markings. It is steeped with the traditional aromas of classic Kentucky bourbon. 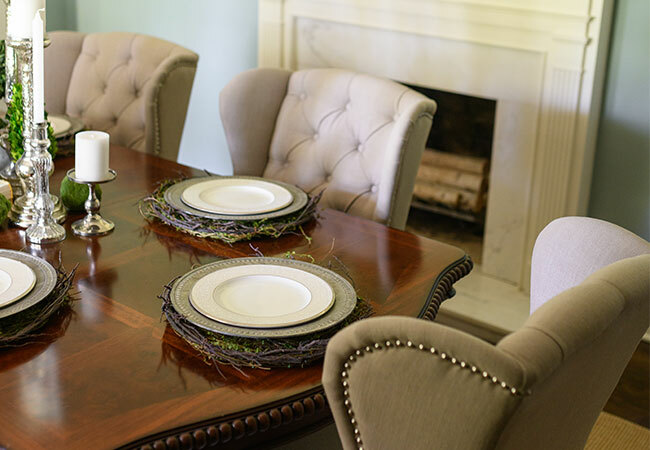 Much of the furniture was purchased from Arhaus, with additional pieces from Interior Yardage and houzz.com. The technological features were provided by Bluegrass Entertainment. 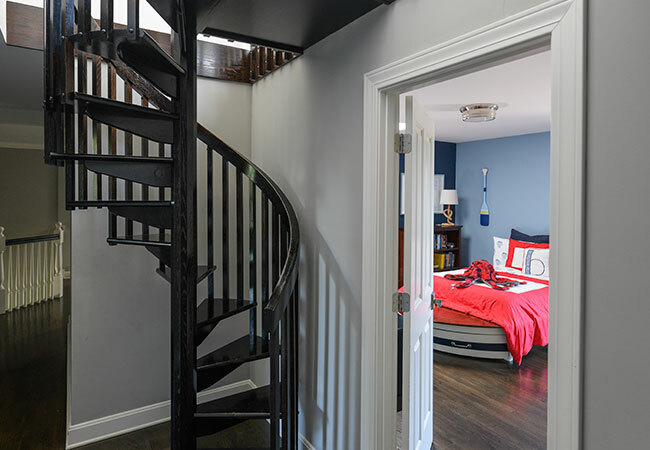 Cull also assisted the homeowners in replacing all of the home’s light fixtures (which were supplied by Ferguson Lighting), and to design special details, from unique wall coverings in the first floor powder room to a cozy reading nook located at the top of the staircase on the second level. 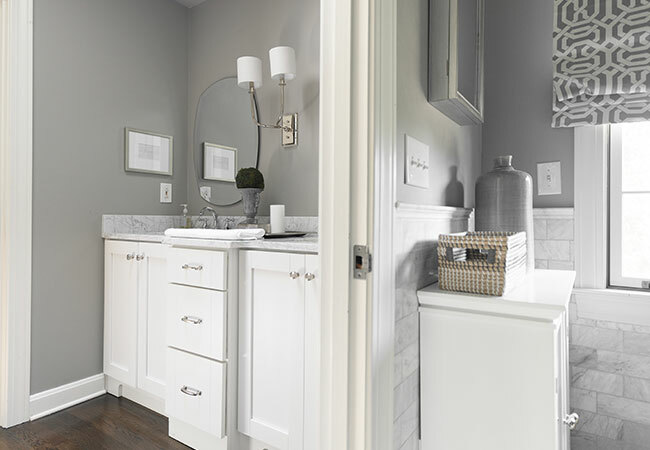 The master suite steps away from the soft color palette using monochromatic gray tones. 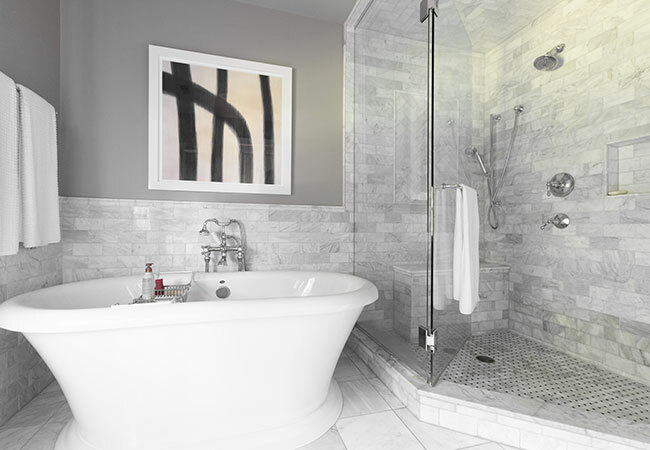 The owners renovated the ensuite bathroom, using Carrara marble throughout. 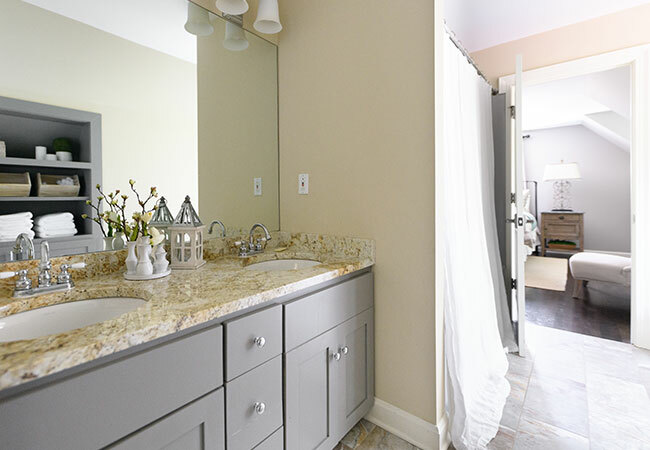 “This home has great bones and lots of neat quirks we were able to work with,” Cull said. 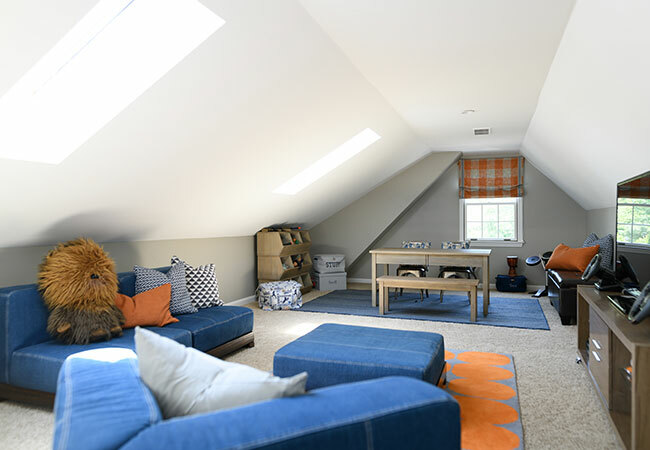 For example, it has an open area on the third floor that the family uses as a kids’ playroom. Cull added that the home already had a great floor plan and flow –it’s not an open concept, but it’s not too closed off either. 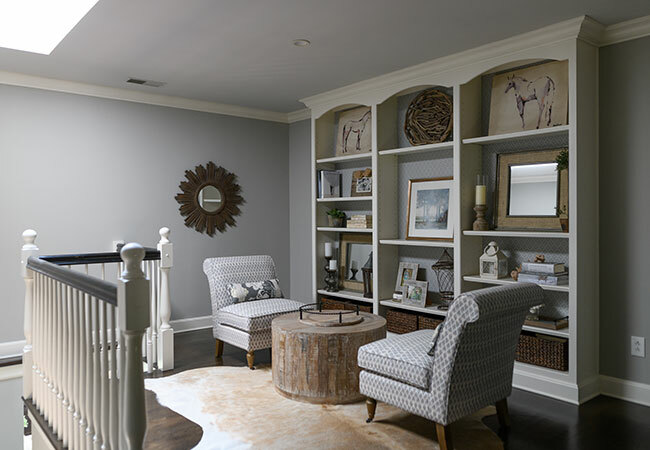 She used those existing spaces to create little comfortable nooks throughout the home for reading, lounging or spending time together as a family. 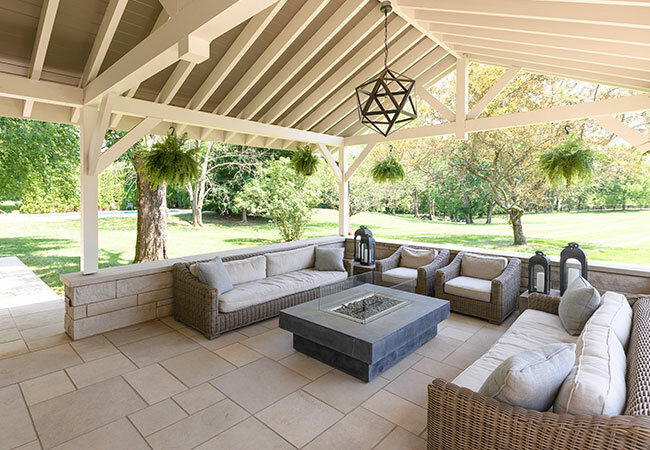 This house is made for entertaining, with its large outdoor living area, complete with a modern stone and glass fire pit and Kentucky limestone covering. The outdoor area is visible and accessible from many areas of the home, blending indoor and outdoor living seamlessly. 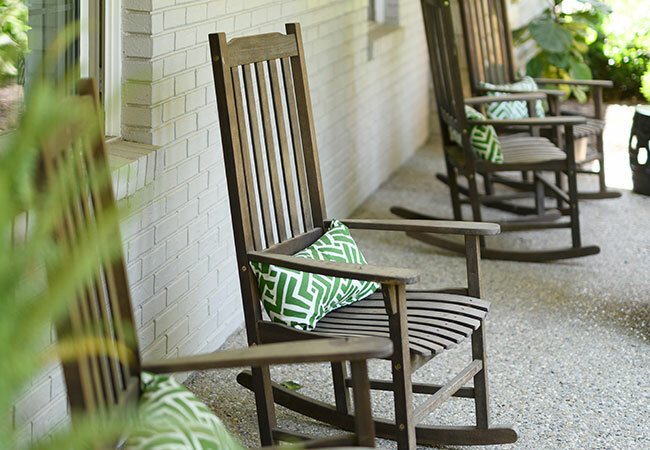 The home is the ideal backdrop for a truly natural and relaxing atmosphere. Recently, the homeowners decided they don’t need quite as much space, so they’ve put the home on the market. Interested parties can contact Dawn Bozee with Biederman Real Estate at (859) 277-2030 for more information.